STEM School student Noah Pierce adds a bit of tape to his team's robot before demonstrating its operation at the EPB Robo Expo held at their downtown operations center on Wednesday, Sept. 5, 2016, in Chattanooga, Tenn. The robot, which was controlled remotely, could navigate obstacles and toss a foam ball into a wooden goal structure. The expo featured teams of area robotics students exhibiting robots that they built for competition. Members of the Greater Chattanooga Robotics board hope to provide every student in the region with the opportunity to be part of a robotics program in coming years. "All kids are capable of learning, they just need the resources, guidance and direction," said Charley Spencer, founder of Greater Chattanooga Robotics, a newly launched nonprofit organization. For more than 15 years, employees at the Tennessee Valley Authority have contributed more than $1 million to robotics initiatives across the Tennessee Valley, and now support robotics programs at about 60 schools. Spencer, a retired financial analyst at TVA who has led the robotics initiatives, decided this year to start the nonprofit to continue and build upon that work. Moving forward, the Greater Chattanooga Robotics board, which met for the second time last week, hopes to secure grant funding and more support to boost robotic programs and expand to more schools. The organization doesn't have employees or a specific curriculum it's pushing to implement, and instead wants to work with schools to support the learning taking place and embed robotics into the curriculum. 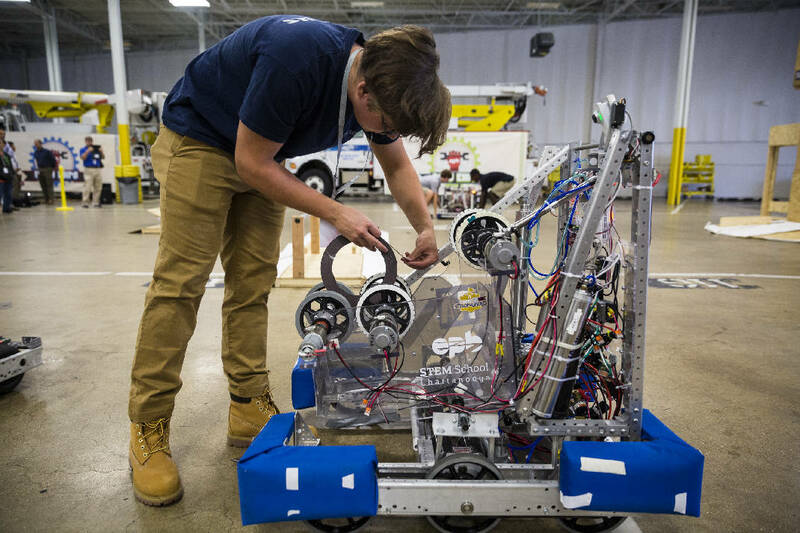 "There is a pent-up demand for robotics," Spencer said during the board meeting, adding that schools often don't have money in the budget to fund the programs without help. The robotics programs in schools range from programming and controlling LEGO robots in the younger grades to high-schoolers building massive, complex robots that can perform tasks like throwing a Frisbee at a specific target. Spencer said robotics play an important role in preparing students of all backgrounds to enter the workforce, as it forces them to think critically and solve real-world problems. "Robotics is also one way to expose kids to technology," he said. Scott Rosenow, a Greater Chattanooga Robotics board member and technology integration specialist at Chattanooga School for the Liberal Arts, has been involved in robotics at several schools for many years. He said he's seen the impact robotics can have on students. "It flips a switch for some students," Rosenow said, adding that he's seen kids who struggle in school excel in robotics because it's more hands-on. "It can give kids a certain level of success too, which they might not get elsewhere," he added. Moving forward, Rosenow hopes the organization can equip and support educators to expand programs and train more teachers to be robotics coaches. Richard Manning, a retired electrical engineer who helps with high school robotics programs and is a member of the board, said he hopes community and parent involvement in robotics will increase through the nonprofit's work. Greater Chattanooga Robotics hopefully will rally volunteers to help with robotics competitions and recruit more people to be involved in the school-based robotics teams, he said. Bill Copeland, director of business intelligence at EPB, said he hopes Greater Chattanooga Robotics will encourage more businesses to get involved in local schools. "I see [robotics] as a catalytic program," he said. "We are trying to create things businesses can do to support schools." Business leaders keep saying they need a well-trained workforce, Copeland said, and robotics provide a way to start developing local talent at a young age.